Hornets, yellow jackets, and all wasps are generally beneficial predatory insects that feast on soft bodied insects that often wreak havoc on our food crops — often fruit trees. Unfortunately, resident wasps on fruit pose a bit of a danger. For this reason, keeping wasps away from fruit trees is important. Do Fruit Trees Attract Wasps? Almost an inane question, “Do fruit trees attract wasps?” While wasps feed on a variety of pests during the early to mid growing season, their interest shifts from those protein sources to the irresistible sugary taste of ripe berries and fruits in the late summer to early fall. Don’t we all lust after the fresh produce of that season? It’s no wonder wasps in fruit trees are as intrinsic as people in fruit trees. We both want the same thing. Of course, the down side of these tiny predators habituating the same arena as humans is their potentially dangerous stings. For some people, the sting from wasps on fruit may be a painful annoyance, but for others it is a very real threat, potentially deadly. Many people die from a single wasp sting if hypersensitive to its toxin; for those not allergic to the venom, it takes about 1,500 stings to become fatal. Wasps in fruit trees will vigorously defend their territory when disturbed by harvesting hands and ladders. Some protection is provided by wearing heavy clothing with gloves, socks and boots taped or banded underneath so the wasps can’t reach tender skin. Also, a bee keeper’s hat and veil are not a bad idea. However, if you are allergic (call an exterminator and do not go near the nest!) or the wasps are seriously impeding your ability to harvest the fruit, keeping wasps away from fruit trees may be of paramount importance. Since the wasps are attracted to the sugars of the ripe fruits, you should know they are interested in the juice oozing intoxicants of damaged produce as well. Make sure to maintain a tidy area around the fruit tree, cleaning up any fallen fruit and cull any damaged fruit still hanging from the limbs. Control products containing pyrethroids and penetrans can be used to control the wasps in trees; however, pyrethroid sprays may also eliminate beneficial predatory mites, resulting in greater populations of pest mites. Broad spectrum insecticides with organophosphate at specific times dependent on the species of hornet or yellow jackets may also reduce populations. Many species die off in the fall except the queen. Eliminating the queen in the spring before she can lay eggs and begin to grow a colony is easier and more expeditious than attempting elimination of an entire colony in the fall. When spraying the wasps in trees, it is best to purchase an insecticide called JET spray, which will emit a solid stream reaching ten feet or greater rather than a fine mist that barely reaches a foot. 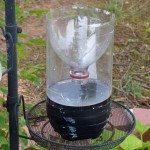 Wasps are inactive at night, so this is the best time to treat the nest. Use a flashlight with a red filter; wasps do not view the color red well. Spray the entrance quickly and thoroughly two hours after darkness falls, then don’t linger, walk away and stay away for a full day. If you are treating a ground colony, cover the entrance with a quick shovelful of soil to block the entrance. 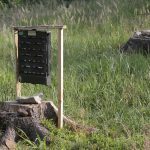 Finally, a bait trap filled with fish or other meat early in the season may also help in keeping wasps from fruit trees. These exist commercially or you can fashion your own.